The new paradigm. Everyone has a voice. The new reality? Even a 12 year old has the power to make things happen, quickly. Everyone has the ability to create buzz. Everyone has the chance to tell a story. Everyone has the platform to have something go viral. Case in point: 12-year old Maddi Jane — who has been lighting up YouTube with covers that have racked up over a 145 million total upload views on her YouTube channel. Not limiting herself to just YouTube, Jane, back on Sept. 10, crossed the threshold of 400,000 fans on Facebook-with 500,000 not too far off. Excuse me while I say the following: If it wasn’t for social media, you wouldn’t be anywhere near where you are right now in your career. To put it more succinctly, social media has made a lot of you. Yes I know that’s like saying if it wasn’t for the internet Bill Gates wouldn’t be anything but another coder, but let me back up. You see, for a lot of us, and notice I said us, social media added that missing layer. That missing dimension, that lens into our personal, private and public lives. In a way, using social is very much like wining and dining to get what we need. For some, utilizing social media to “court” others and market ourselves, is the same as drug reps taking doctors on ski trips to “earn” their business. Or going out on a date where we both talk about ourselves. It’s an interview. It’s the handshake and the introduction. Social is the empty seat next to you on an airplane that soon will be occupied by someone you can talk to for 3 hours. Or not. The potential is there should you choose to engage. The seat is the tool or the platform for discussion..
People have been using each other for centuries. In social media, the same holds true. People are using each other because they’re seeing that our social selves can be so easily intertwined into our ability to create, and curate; and yet it’s also dependent on consumption, its dependent on sharing, dependent on broadcasting the message, the message that is you and me. Some of you may or may not know this but we are feeding off of each other. We’re sitting across from each other on that plane and we both have the same opportunity to talk to each other and take it to another level. Without those elements, you are nothing but a product of what we were prior to the boom of the internet- a product of the 80’s and early 90’s. You are static. Social has added flash to your being. It’s added substance to who you are or… who you want to be, should you so choose. Think about this. Linkedin is and became one of the initial gateways into people’s lives; and for a lot of people, who were never into that “social thing”, and who are still not that social, Linkedin is their gateway into social media. In fact, if we go by the 90-9-1 model, Linkedin might be as social as some people will ever get! But at the end of the day, is Linkedin a social network? Perhaps. It has elements of social. But what Linkedin really is, is it’s our vetting tool. It’s our way to learn more about others, and have others learn more about us. But really it may have evolved with Linkedin, but it started with blogging. Social has a quid pro quo nature to it. In fact, today’s social elements were born out of the early days of blogging which were veiled in a sensibility of “us versus them” camaraderie. Essentially it boiled down to a “if you show me yours I’ll show you mine” mentality of reading, commenting, and sharing each others blogs. It was almost the manual defacto way that you grew your readership. But it also allowed us to show each other and others our many layers in ways in which we never were able to before. Blogs allowed us and allow us to say whatever we wanted when we wanted, and we used each other, and then we used someone else, and they used us too-and we let them, if it grew our readers. It’s how blogging works. Funny but in the non-blogging world, we indirectly and directly use each other every day by associating ourselves with new people and entities that we think can help us get where we want to go. It’s not sacrilege to say this but people use each other all the time; but it might be sacrilege to say this though…Using each other is the nature of social media. We call it social media but it could easily be called useful media. Social has added that dimension of vetting the who, search added the dimension of vetting the what. Yet we still have to work, we still have to pay our bills, and eat, drive, sleep and do that daily mundane life stuff; because the human element still weaves its way through all of that offline stuff. The new difference is, social media is adding that dynamic layer of personal utility. It’s adding the layer of creating who we are, so that someone might see who we are. Social is selfish. It helps us. It connects us. And that’s not a bad thing, it’s more just the reality of where we are going. Social Media Conundrum #12: Justin Bieber is popular, but he’s not influential? I can’t believe I’m going to weigh in on this, but I saw a tweet from a notable social media analytics consultant in which the following was stated for the umteenth time. I immediately thought, “Could Justin Bieber and Lady Gaga sell product”? Isn’t that influence?I then had to go look up a quick definition of influence. ˈɪn flu əns/ [in-floo-uh ns] noun, verb, -enced, -enc·ing. 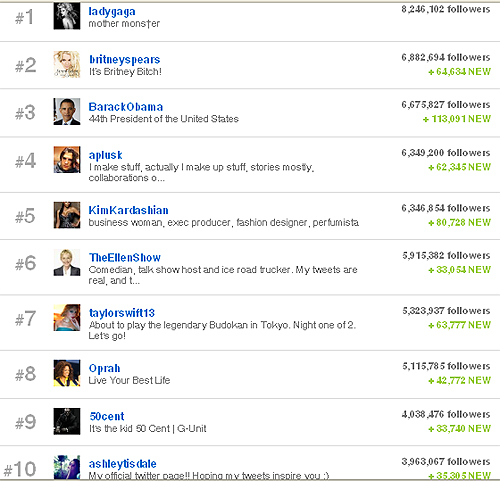 First I wanted to check something on Twitaholic: The top 15 people being followed on Twitter. 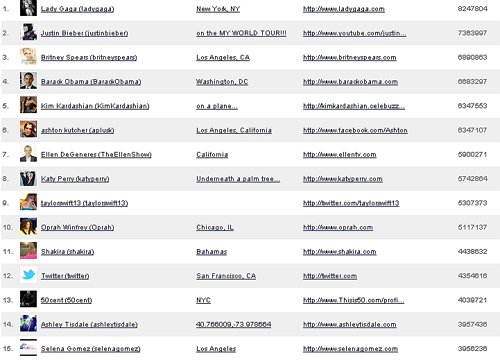 This is a list of the top 15 most “popular” people on Twitter. Let’s look and see who could sell or who does sell product. Let’s pare the list down first. We have Justin Bieber, Lady Gaga, Britney Spears, Kim Kardashian, Ashton Kutcher, Ellen, Katy Perry, Taylor Swift, Oprah, 50Cent, Ashley Tisdale and Selena Gomez. 12 Celebrities from the world of entertainment. Immensely popular. But are they influential? Can they produce a compelling action on someone to buy product? Could they change behaviors and opinions? Can they influence people to buy stuff? Lady Gaga sells video sunglasses for Polaroid, headphones for Beats by Dre, phones for VirginMobile, and a host of items and services via product placement in her videos. All this adds up to roughly $5-$10 million per year. Rather than quote the whole article from Guy Kawasaki, read about Guy’s experience at a Justin Bieber concert and the machine behind his persona. Britney has deals with Elizabeth Arden and Candies. Taylor Swift has deals with Sony and CoverGirl. 50 Cent has deals with Reebok, Vitamin Water, Right Guard, PlayStation, and Steiner Sports. We could easily go through each celebrity on this list and view the products that they sell. They sell the products because they can influence buyer behavior based on their celebrity, based on their popularity. Am I wrong? I know sales are one thing and fame is fleeting, but because of their celebrity and popularity they can influence buyer behavior right now. Right? How can you possibly say no? Isn’t that influence? What am I missing here? Help me out.